Sunshyne's Skin Regimen - Hairlicious Inc.
you have beautiful skin! i need to get back to using baking soda to exfoliate. thanks for sharing!! MY SKIN REGIMEN HAVE 2 PRODUCTS. UNREFINED AFRICAN BLACK SOAP AND UNREFINED SHEA BUTTER. I WAS MY FACE IN THE MORNING AND NIGHT WITH THE BLACK SOAP AND I DONT DRY MY FACE JUST APPLY MY SHEA BUTTER ON MY DAMP FACE. THEN I PAT DRY. IM NOTICING MY SKIN IS EXTREMELY SOFT AND MY FACE IS CLEARING UP WITH A BEAUTIFUL EVEN AND GLOWING SKIN TONE. You mentioned you have oily skin yet you moisturize with shea butter. That doesn't clog your pores? I have acne-prone skin too and I'm scared to try it, but if it works for you I might give it a try. Where do you find unrefined shea butter? I'll have to try the baking soda sometime, baking soda has so many wonderful uses - incredible. Great tip! Wow! amazing. I myself also using shea butter on my skin and hair and i am seeing great results, especially on my feet and hair. So i deceided to start selling shea butter mix. If anyone interested check out my website at www.sheabutterskincare.webs.com Amazing product. Love it. interesting! 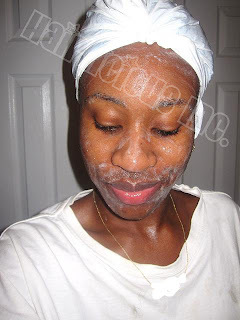 i never thought to use baking soda to cleanse my skin. i just use african black soap & apricot scrub to cleanse and pure cocoa butter to moisturize. slow results but it works! Do you use a sunscreen, if so, which one? Your screen looks great! Thanks for sharing. Ive been using shea butter as a moisturizer for a few months and love it. Cheap too. Never thought to use baking soda on my face? Cetaphil is a good, gentle cleanser and I've got that same tub of shea butter. Seems like a good idea that I'd like to try. Thanks very much for sharing! Thanks for sharing Sunshine :) I always thought you had great skin. Tried baking soda and cetaphil last night and my face feels amazing. I don't have oily skin or any other skin issues so I plan to do it at least 1x a week. I will continue to use the cetaphil, though. Thanks for sharing. I used my fave Nadinola cream afterwards. I love it. Never tried this but I think I might. I also have some dark spot that I hope will smooth and fade by using this technique. I'll let you know how it goes. @ Kimmy8188 - Hey Kimberly :-)Wow!! That's great. Shea Butter is the best. @ Katrina - Yes I have normal to oily skin and no shea butter doesn't clog my pores. I got my shea butter at my local beauty supply store. @ The Beauty Xchange - Thanks for the suggestion. I'll check it out. @ MissAnnaBanna - Yes, baking soda is a great cleanser and exfoliator. You should try it sometime. @ Anonymous - No I don't use sunscreen. Shea butter has sunscreen properties. @ Anonymous - Yes, it does remove make-up. @ Dhiane - Your welcome my dear. @ Anonymous - Your welcome! thanks for the compliment. I've tried my best to clear up my skin and so far this regimen is the best yet. @ Manune - No greasy face here. I only use a small amount. I wear make-up as well. The shea butter gives a nice glow..not an oily face. @ LaQT - Aww that's awesome!! Thanks for sharing that with me. @ Hair and Beyond - Please try and let me know how your skin reacts. @ LaTonya - My dark marks are fading because exfoliating removes the dead skin and the shea butter heals it and fades the dark marks. @ Attayah - A burn? maybe you were too rough or your portions (of the cleanser and baking soda) were a bit off. Have you ever used baking soda on your skin? Maybe it's just the initial reaction since your skin is not used to it. Give yourself 1-2 weeks to see if it clears up. i also used african shea butter on my face but only at night time which was A-MAZING!!! @ Attayah. I haven't had any burning issues, but I knew from the moment I used this that this is not something I need to do on a day-to-day basis for my skin. I do it 1-2x a week and I have noticed a difference in my skin. I don't think my skin is sensitive but if I would I have tried this every day then I probably would've been burned too. I've varied the amount of baking soda I use and it still seems the same. I use just Cetaphil on the days I don't add the baking soda. If you should decide to try again. Don't do it back to back and see how that helps. I have sensitive dry skin which prone to excema and currently in remission from psoriasis. I've been using sheabutter on my face for a good while now and while I might now and then try some other concotion, i always go back to Sheabutter either on it's own it in a mix. I' currently trying baking soda+seaweed+oats as my exfoliant, even with a few drops of essential oil, it stinks :-) but has been effective, scars left by some stress-spots have faded.